THE WINNER IS THIS GIVEAWAY IS Angie Meers Lanigan!!! YAY!!! I love when I get to have such fabulous giveaways! My Silhouette machine is one of my favorite tools. I find uses for it all the time. 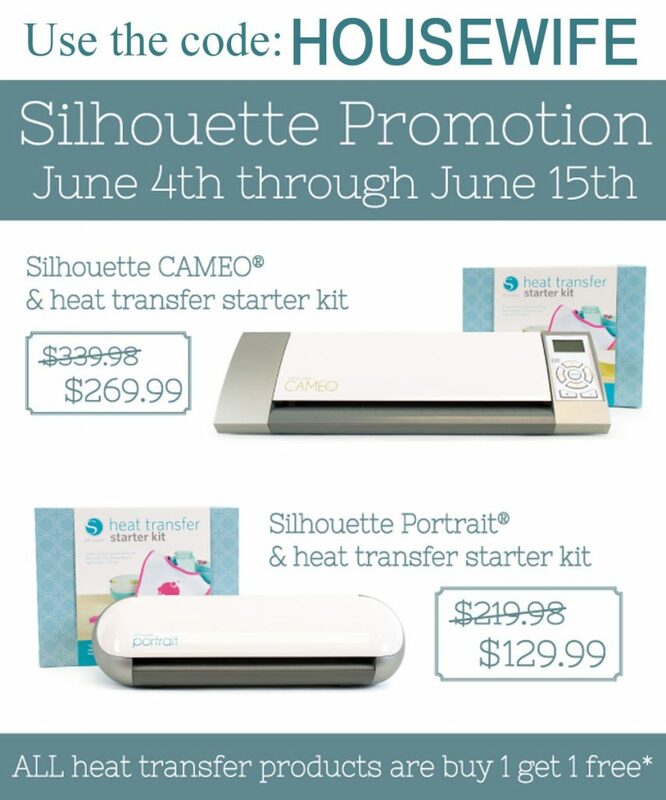 And I was SUPER excited that the promotion for this month was for the heat transfer because I LOVE it. And then my heat transfer stuff didn’t come in the mail so I have not been able to make anything to show off. But maybe it will show up soon and I can squeeze a project in this week. Before we get to the giveaway I want to announce the promo details. To take advantage of the deal you must visit the right landing page. 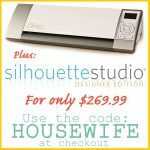 Please visit: www.silhouetteamerica.com/heat and use the code HOUSEWIFE at checkout. Is the printable heat transfer stuff new??? I have been living under a rock, I don’t know. But I think that is pretty freakin’ awesome! Alright, let’s get down to the giveaway, shall we? 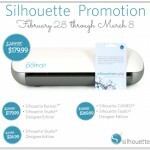 Silhouette is giveaway one lucky winner a Silhouette Portrait machine!!! Open to US residents only who are 18 years or older. Winner will be announce Monday June 10th. Winner has 24 hours to contact me or a new winner will be chosen. The winner will be chosen by random.org. You can do one or all of the following entry options through Rafflecopter. Please let me know if you have any trouble with the Rafflecopter widget. If I were the lucky winner, I would transfer some images onto throw pillows. I would do some transfers onto some cute fabric and hang it up on my walls. I have some blank walls in place! Actually I have no idea what the heat transfer stuff does – I’m going to have to look that up. Shame your package didn’t arrive in time. Thanks for offering the giveaway – its a great opportunity for all of us that can’t afford to buy one, but just might win one! I’d make custom t-shirts for my boys! I have so many things I would make with this!! I love to make wall hangings as well as many other crafts :) It would be such a blessing to win this & be able to pass the blessings on to others with the things I’d create with it! I would make home decor and some cool designs on clothing and bags! I would love to make some t-shirts for my girls. if we are lucky enough to win one, my girls would make some cool transfers to customize their clothes! 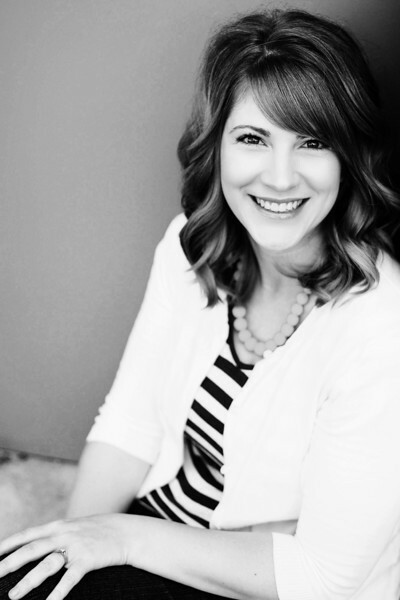 Thanks so much for hosting this week Stacey! I would love to make some cute July 4th shirts for my girls! <3 Ty so much for the chance! I think I’d use it for a pillow makeover! Thanks for the Giveawaay! 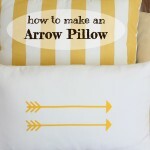 I would make pillows. I’d decorate some t shirts and some onesies. I would make birthday shirts for my kiddos! I would make cute shirt designs for my girls and especially for our trip to Disney!! I would make some cute totes to take to the beach! I would make baby onesies! Soooo cute! Tshirts. The new marching band season is upon us and I need new shirts! I would make shirts and onesies galore! I’d love to experiment with tee-shirt designing! I would design some cute pillows! Id love to make all types of things from tshirts to totes! I am an artist and id love to see my creations on items I wear! I would use it to embelish nursing covers and onsies to start! I’d love to design a new tote bag for church! In love with the Silhouette. Would love to win one! Oops! Forgot to answer . . . I would definitely make some totes for my nursery workers at church. Would love to make my littles matching shirts! I would make images for Throw Pillows or Onsie’s for all my friends’ babies! :) Thanks for the opportunity! I have 3 boys – who could wear matching t-shirts EVERY. DAY. this summer!! I really think I want to make curtains with the heat transfer material if I win the Silhouette! Thanks so much for hosting the giveaway! 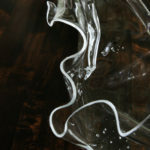 I shared on Facebook via my blog page! Would be so much fun to learn to use! There are so many things to make but the first thing I would make is shirts for my kids! I’d love to try making a crochet/knitting bag with a nice heat transfer embellishment. Thanks for the great giveaway! I have been coveting this for quite some time! Family t-shirts for our summer road trip! I would make Youth Camp Shirts for all the leaders!! I’m not sure what I like more, the 12 inch width of that machine OR learning that I can heat transfer to material! I don’t think I want the flocked material. I wonder why they don’t sell the regular heat transfer vinyl alone instead of in the kit. Anyone use another heat transfer vinyl with success? I would make gifts for the family with my daughter’s pictures on them! I would love to customize my son’s sports uniforms with pictures of the team mascot that the team chose. We need a new beach tote. I would probably make that. I would make new shirts for our cancer walk team! Many projects for my preschool class. Oh so excited! I like the idea of making a cute canvas summer tote. i would make pillows and t-shirts. i love all kinds of crafts. There are so many things I could do with this. It would be so much fun. I think I would make some pillows for the patriotic holidays and Christmas. My fingers are crossed…thanks for the opportunity!! Love heat transfer for shirts! Probably shirts…I go on vacation with my six kids every summer and my husband can’t come with us. It would be fun to have some matching homemade tees to help pick my kids out of a crowd! I’d make some appliques on t-shirts for my little sisters. :) Thanks for the chance to win! I have a lot of pregnant friends so I would make a bunch of cute onesies for the babies. I would make personalized beer/wine bottle buckets for my upcoming wedding!!!!! I cant choose!! I just want to CREATEALLTHETHINGS!!! 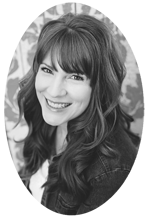 Items for around the house and my daughter is a school teacher…. I would make a beach tote for my daughter! I’d make some personalized totes for the teachers that work at the afterschool program that I am an administrator for. I would make onsie designs for my grandson. I would make T-shirts for our Summer vacation! not sure what i’d make, maybe a pillow, but i’d think of something. Think of all the cute things I could make with my kids this summer… I promised the girls an art project every Friday – this would be awesome for that! T-shirts for my boys with a summer theme! I know it sounds boring, but I want to use it to make clothing labels. I would like to make birthday tshirts. I would use it to make dish towels, tshirts, borders on window treatments….ahhh the many possibilities! I would love to make some baby gifts for some friends that are expecting! I would love to win this! I have 2 young daughters that would really enjoy making stuff with me. The possibilities are endless with this thing! I would love to start with some t-shirts! I would make some decorated onsies. I have so many things I would like to make using this, but mostly pillows. Thanks for the chance to win! With the heat transfer vinyl I’d make some cute boy shirts, and unique girl newborn onesies. Oh my gosh! I would make tshirts, onsies, curtains, pillows – just oodles of things! Would love to win this! Thanks so much for the giveaway! I would try to make a Father’s Day gift! I’d make some cute little onesies (with heat transfer) for my newborn! I would love to put my first grand’s birth info onto a tee or a pillow top! Lots of thoughts! I would make my daughter a cute shirt! maybe someday….itwould definitely up the quality of my girl scout crafts. I’d love to make shirts for my kids…this looks so much fun. Thanks for making it look easy !! Decorative pillows and T-shirts in my Fashion class. I would make new pillow covers for my living room. TSHIRTS!!! i’ve been so impressed with the looks i’ve seen online lately. I’d love to make tshirts for my boys! Thanks for the chance to win! My kids would be stylin’ in some awesome personalized shirts! Thanks for the party and giveaway! I have been eyeing one of these forever. I would use it for so many things including decor for my classroom! I would decorate tshirts for my boys! Gosh, what wouldn’t I try to make?! I’d probably start with decoration for the upholstery of the chair I”m recovering. Not sure where I would begin with projects, but most likely something for my daughter. I would love to make totes for my best buds! Thanks for the opportunity to enter. A onesie for my new niece! Not sure what I’d make first, but that tote bag youmade is pretty darn cute. Printable you say???…. I want to make superhero shirts for my son! I would love to make some cute T-shirts for my kids! I love that tote bag in the picture and so I’d definitely start with a whole slew of tote bags. I’d love to have some attractive shopping bags, since the designs, such as they were, have been mostly washed off my cloth grocery bags so they look pretty funky. A big brother shirt! I’m due in July! I’d make a library book bag. I would transfer something for my son’s November wedding. I think I would make some monograms for pillows. I would love to make some home decor items – especially silhouette pillows with my pets on them! I would love to make a family name sign! I would make some cute personalized zipper pouches for my sisters and for my bedroom some awesome pilows with some fun quotes. I would make some onesies. Every room in my house needs some sprucing up and this would do the trick! Oohhhh! I want one! I would use it to make decorations for every single holiday! I’d make a special pillow for my son’s nursery rocker. Thanks so much Stacy for another fun party! Thank you for the party and the giveaway! I would love to win it, I like the answer the possibilities are endless! I would make new throw pillows for my sofa, chairs, bed, etc. 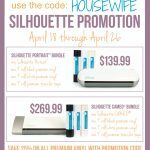 Thanks for the opportunity to win a Silhouette! I’m not sure what I would do, but I’d do something cute!! I have been wanting one of these for years!! Hope I win! I’d love to make onesies for all of my friends that are expecting! I would love to try my hand at making a shirt for my daughter. Thanks for the chance! I would make some cute onesies for an upcoming baby shower. Pillows seem like the best option for a heat transfer for me, but that bag with the bird on it is adorable! My husband wants a personalized t-shirt, and I would love to be able to make one with the Silhouette; if I were lucky enough to actually win one!! The first thing I would like to use it for is to make a Library bag for my little girl. I would love to make some shirts for my boys and my husband. Thanks!! Would LOvE one of these !!!!! I’d make some gifts for some expected little ones! I love those “I love big books and I cannot lie” tote bags! I would definitely make shirts for my sons! Thanks for the giveaway! Onesies for my expected grandson and T-shirts for my other grandchildren. CHUBBY GIRLS CUDDLE BETTER T shirt for me. I would love to make some 4th of July shirts for the family and some home decor projects (okay, the list is too long to list). Cool tool! I would put decals on my wall, put a picture on a canvas shoulder tote and have tons of fun with one of those machines. I would love to make matching aprons for me and my little girl! I would love to make shirts with the shape of Arkansas on them, or one that says “I <3 AR" since that's where I'm from! Thank you for hosting this giveaway!!! I have been wanting a silhouette for forever!!! I hope I win, I can’t wait to get crafting with it!!! I would make running shirts for my husband and I when we do our 5k’s that say: FUN RUN on them! I would make so many things with the heat transfers and wouldn’t even know where to start. Boy would I be busy! I wanted one of these for so long and I really hope I can win one this time. I would make a tshirt for my dad. He loves things like that. I try to make him one each year. My daughter and I have a list of craft things we want to try!